When I traveled in South Korea, food was what I was most interested in exploring. There's no shortage of things to eat in South Korea, and on the outside of just about every single restaurant, there are incredibly tantalizing food photos pasted on the windows. While the food is nearly always satisfying, today I'm not going to focus on the main dishes, but on one of the most revered and beloved components of Korean cuisine: kimchi. Kimchi cannot be defined exactly as a side dish, nor as a condiment, but it's rather an essential component and complement to a main dish. 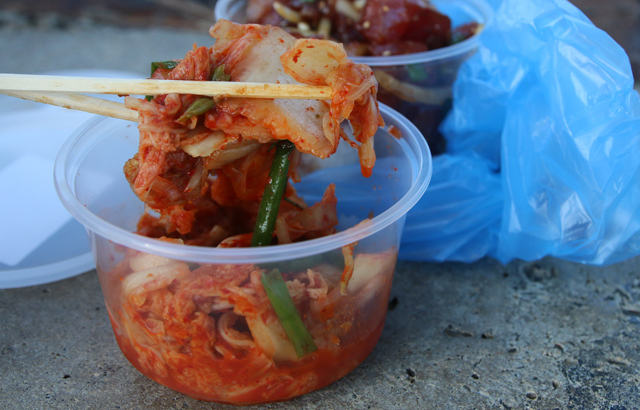 Practically the entire worldwide population of Koreans eat kimchi multiple times a day. In broad terms, it's a slightly fermented or cured vegetable pickle. All sorts of vegetables can be pickled into kimchi, but a few of the most popular versions include napa cabbage (which is present at nearly every meal), cucumber, and daikon radish. The veggies are layered with chili flakes, green onions, and salt, then left to ferment. The process makes the vegetables crisp, spicy from the chili, with a tinge of sourness from the fermentation (sourness can depend on how long the kimchi sits, some like it sour, others like it fresher). South Korea, situated in the northern part of Asia, has extremely cold winters and just about no vegetables can survive the weather. Recorded in South Korea as far back as the 7th century, pickling was used to preserve vegetables and store them throughout the winter. Back then, the vegetables were only cured in salt water. It wasn't until the 18th century, the period when chilies were introduced to South Korea, that dry chili flakes became an important ingredient in the kimchi recipe. Now, just about all kimchi includes chilies. 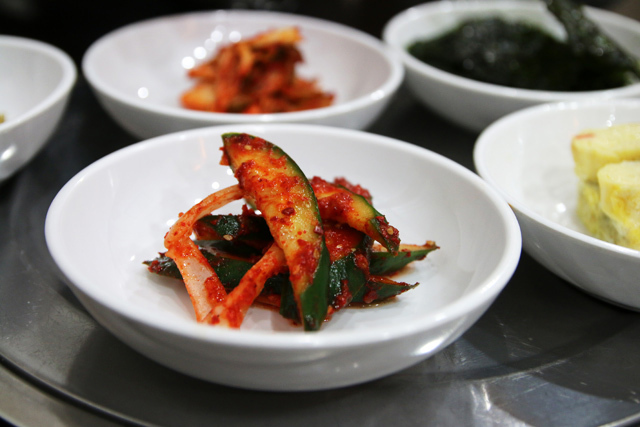 There are so many delicious Korean dishes like tofu stew, tasty grilled meat, seafood pancakes, and many more, but one of the most impressive aspects of any Korean meal is banchan, or side dishes. Sit down at any Korean restaurant or even a Korean's home, and you'll first be presented with a series of small petri dish sized bowls of flavorful items to eat with your main course. Kimchi is always a part of any banchan spread. Usually at least napa cabbage kimchi is served, but also the daikon radish or cucumber versions are common. After taking a bite of rice and meat, you can then grab a piece of kimchi with your chopsticks, and garnish your bite with kimchi. Another eating method is to grab a piece of kimchi, add it to your bowl of rice, and eat it altogether in a single bite. Not only does kimchi enhance a meal and taste amazing, it also apparently has quite a few health benefits, as Koreans will tell you. One of the biggest kimchi claims to fame is that South Koreans experienced very few cases of the 2003 SARS virus, a result that many attribute to having kimchi in their diet. Lactic acid bacteria, vitamin A, vitamin C, calcium, iron, and a dose of dietary fiber are few more of the health benefits of eating kimchi. I personally can't get enough kimchi, and every chance I get, I eat it. 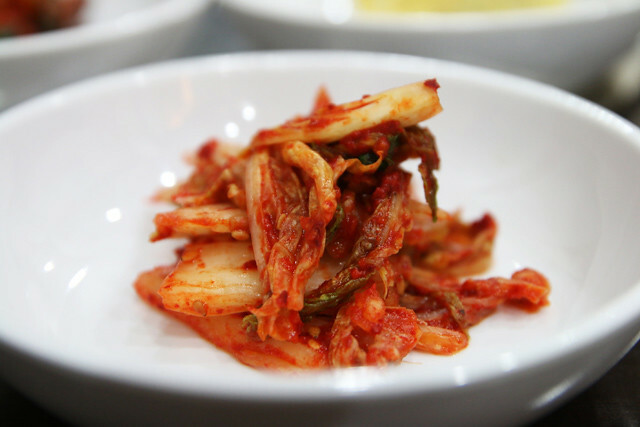 Korean food is a wonderful cuisine, but it's the pickled kimchi that gives each meal that extra flavorful touch. After two years in Korea, kimchi is one of my favorite foods. It’s also great in things like fried rice, dumplings, and scrambled eggs! At first I hated Kimchi and couldn’t understand what all the fuss was about, now it feels strange dining without it. Still a myth to me. Living in Korea, I eat Kimchi almost everyday. A meal without Kimchi (not for breakfast) feels like there is something missing. Kimchi is a never ending exploration because there are so many variations. I have grown to love it but that took some time and repeated trials.